Jason Donovan returns again in Buzz! 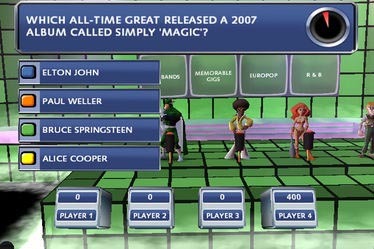 The Pop Quiz that once again offers gamers another attempt at a music quiz game from the 1990's to today which includes bands such as the Foo Fighters and even Nelly Furtado. For those of you unaware of the Buzz! 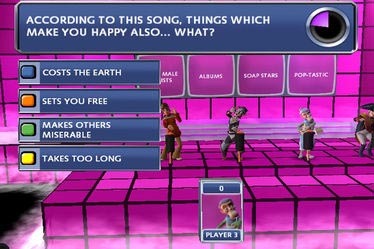 franchise on the PlayStation 2, its essential a quiz game that comes with four buzzers with multi coloured buttons which are pushed in accordance to the various answers that appear on the screen. So that's basically it, grab three friends together (or more) and give each one of them one of four buzzers in order to see who the music quiz genius. With a variety of new gameplay modes, Buzz! 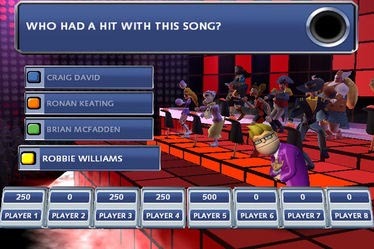 The Pop Quiz seems to pay homage to the original game with its similar games, however some of the new rounds in the game are actually entertaining such as the Wall of Sound and my personal favourite Pop Picker. The game itself is quite dull when played alone, however when the friends or family around, the game begins to take on a life of its own. The title also contains over 5000 different questions and will definitely challenge even the most music apt gamers in the world. Graphically the series has received a much needed facelift compared to the previous editions, although the game is still quite "cartoony" in appearance. The characters are more detailed and move with more animated emotions and the Buzz! studio is much more flashier with lighting effects, almost making you believe you part of this quiz series. 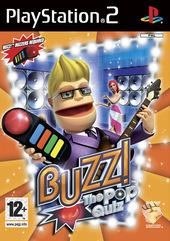 Since the last installment of Buzz, the game features quite a large amount of music that contain original recordings, modern renditions and instrumental versions. This is a mixed bag as some of the PlayStation 2 "remakes" of the songs seem a little lackluster in the music department which is a shame, considering the wide variety of questions in the game. Of course Jason Donovan makes a welcome return and sounds as cheesy and clichéd as ever that actually can get on your nerves as the game progresses but he essentially what has made the game so popular. Sad but true :) Even so, it's good to see Jason Donovan working... ok... enough nastiness, he's actually kind of cool in it. In conclusion, Buzz! The Pop Quiz does offer the gamer a few new gaming modes, although nothing too impressive over its predecessors as players try to outwit and outsing each other as they answer a variety of music orientated questions. At the end of the day, Buzz! The Pop Quiz seems like an "addon" rather than a full blown original game that banks on the popularity of the previous titles. If you are interested in the music quiz genre, you might want to check it out, however if you are only interested in the title because its a Buzz! game, you might be a little disappointed.